You might consider replacing whatever photo you have under the subject Happiness, with the one above. You won't be able to define it any better than: A crayon candle in you birthday morning Banana Waffles. Singing Happy Birthday was just the Syrup on top. Yep, this one will brighten my days for some time to come. Lukas, today you are two years old. Wow! When I stop to think, it’s astonishing to me how two years could have passed since you first arrived in my arms a squishy and squirmy, but unbelievably beautiful, little person. And, though at times it still seems like only yesterday when I laid my eyes on you for the first time, I reconcile this timeline with the realization that there is no possibility that one mind can create this many sublime memories in a single rotation of the planet Earth. 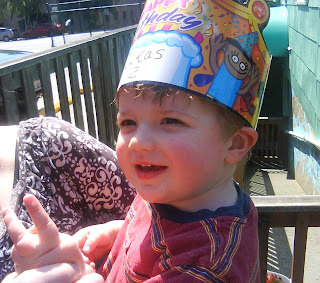 Son, your mother and I have watched you grow in those two short years from that beautiful baby into an inquisitive little boy with an ever present smile and contagious laugh, capable of brightening even the gloomiest Seattle day. Watching you develop your empathy and communication skills has been nothing short of amazing to us, as you now can understand much more of what we communicate to you than I ever would have dreamed you would at this age. And your ability to communicate back to us in so many diverse ways, including through an ever-expanding vocabulary, is a pure joy for me to behold. Lukas, two years ago you opened your eyes onto the world for the first time, and through the haze recognized the two people who will always love you without condition. At the moment of your birth I had a feeling that I could never love you more than at that singular defining moment. At that moment I was a father. But I was also wrong, since with each passing day, week, month, and year son, my affection for you multiplies exponentially, defying conventional boundaries. Buddy, your mother and I say this several times a day, but that doesn’t make it any less true. The fact is that “You are such a good boy!” and you deserve to have this, and many, many more happy days. I love adventure. And, even though I am now a father and thus get little actual adventure, aside from the the emotional and physical highs & lows of raising a 2 year old, I still consider myself an adventure buff. Adventure movies: My favorite type. Adventure magazines: I read these and daydream. Adventure books: Have read more than I can remember. Stories about braving rugged seas, traveling to remote and dangerous locations, and climbing far off peaks have always held an alure for me that is hard to describe. But, now that I am a father and tend to get worn out simply climbing the stairs after a long day at work, I have been content to let my adventure Jones be filled only vicariously through these mediums. In 1910, four locals (Tom Lloyd, Peter Anderson, Billy Taylor, and Charles McGonagall), known as the Sourdough expedition, attempted McKinley, despite a complete lack of climbing experience. They spent approximately three months on the mountain. However, their purported summit day was impressive: carrying a bag of doughnuts, each a thermos of cocoa, and a 14-foot (4.2 m) spruce pole, two of them reached the North Summit, the lower of the two, and erected the pole near the top. According to them, they took a total of 18 hours — a record that has yet to be breached (as of 2006). No one believed their success (partly due to false claims that they had climbed both summits) until the true first ascent, in 1913. A later expedition confirmed the existence of the spruce pole at the summit. 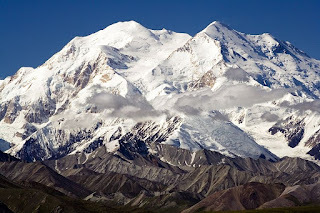 So if I am reading this correctly: A group of buddies back in 1910, with no previous climbing experience, grab some hot chocolate and a bag of doughnuts and head up Denali, one of the highest peaks in the world, only to reach the top in record time. A feat which still hasn't been bested to this day? Amazing. This gives me hope that my goofy notions about someday climbing Washington's own Mt. Rainier may not be so far fetched after all. Of course, I will still have to train a bit beforehand just to be on the safe side. If anyone else is interested, you can meet me after work at the downtown Krispy Kreme for provisions. I'll be the one reading an Adventure magazine. When you are an involved parent it can be easy to take for granted the role your spouse plays. That being said, it takes only a morning like today to jerk me back to reality, and to realize that without the mother of my child around I would be spinning my wheels and getting nowhere in a hurry. Mrs. LIAYF had to leave early this morning to catch a short flight to Portland for an important meeting, leaving me nonchalant but confident that I could get Lukas ready and out the door on time to daycare. Hey, he was already dressed and fed when she left. How hard could it be? Cue the Benny Hill music. . . .
As I look back on the morning, I am still not sure why I couldn't quite make things fall into place. Perhaps it was the lack of a plan? At one point, I realized I was already 20 minutes late. And, Lukas pulling everything under the sun out of his toy cabinet to test their varying aerodynamic attributes from one side of the room to another. So, I handed my son his harmonica to distract him while I got everything else together. This appeared to work, so I turned to open the outside kitchen sliding door to grab the one cat who hadn't yet come back inside. I leaned down to grab the cat, who mockingly darted away. #$*#@ cat! Leave it outside for the day? I was tempted, but closed the sliding door and made another foray to grab it. Success! However, as I approached the door, Lukas, still blowing his harmonica, swiftly slid it open leaving me to do a leg buckling side step to avoid tripping on the other cat as it darted underneath my feet. I thought maybe I was being Punk'd. Eventually there came a point where I had retrieved both felines. It took several other minutes to gather everything else up: backpack, daycare bag, coffee, snack cup, his coat and hat. I then gingerly led Lukas down our front stairs, letting him play with some rocks in our courtyard as I hurriedly loaded the car. "Uh, oh Daddy" was the next thing I heard, and I glanced behind the car where my son had wandered only to find his arm halfway up the tailpipe. Pulling out his greasy dirty arm, I then discovered a nearly perfect sized stone lodged inside the tailpipe. Benny would have been proud. Eventually, I was able to find a small enough stick to dislodge said stone and we were on our way, leaving me a embarrassing 45 minutes late to work, exhausted, and with a renewed appreciation of just how much easier mornings go with my wife around to help us out the door. Therefore, let me just say: "Honey, you rock. . . .and please don't schedule anymore early morning meetings!" I haven't written much about my father here on this blog, but thought today would be an appropriate time to do so. My Father is, without question, the hardest working man I know. An Organic Dairy Farmer by trade he is, at 65 years old, still up at 4:00 AM every day of the week putting in hard labor until nearly 8:00 PM each and every night. Sure, there are meals to be eaten, but during this busy time of year for him, most of those are a quick bowl of cold cereal or sandwhich while on the move. Do the math folks. That is 16 hours a day of work, both physical and mental (he is running a business). There are few people I know who could pull those hours off in thier prime, let alone at age 65. I left the farm 10 years ago and have since become 'soft' enough that I would drop about half way through one such day, much less one after another. But what amazes me most about my father is not his physical stamina or the workload he endures. No, what amazes me about my father is what a terrific human being he is. A kind and soft spoken man, along with my mother he raised my brother, sister, and I to understand not only the value of a decent work ethic, but also the merits of lending a helping hand to those in need. Rarely did someone, stranger or aquaintance, stopping by our farm with a story of hardship, not find my father with some good deed to help them out. Whether it be an offer of work, a loan, or a few dollars to help pay that months rent with no questions asked. Whatever someone needed to get by, my father was always there to help them. It didn't matter to him that word got around our town that he was the person to approach if you needed help, someone still needed a kind gesture, and my father was always willing to oblige. This was often to the exclusion of his own needs. My own son, on this Father's Day, is extremely lucky to have my dad as his grandfather. As he grows, I am sure I will be posed with many questions about why grandpa is helping one person or another. It will be a perfect opportunity for me to teach my son about empathy for others. I will just tell him, it's because his grandpa is a decent man, and that he cares about people even when there is nothing to gain for himself. And, that he should grow up to not only be like daddy, but grandpa too. If he does, he will be loved by everyone who knows him. I don’t pretend to understand it, but do have this particular topic tabbed in the Good Husband Handbook for quick reference whenever the need arises. Empathy is the key here guys. But, of course, you already know this. Even if you really do like her new haircut, it does absolutely no, I repeat NO, good to mention that fact. Because when haircut trauma is happening, all forms of man styled logic can simply be chucked out the nearest open window. Now, I have short hair and can only guess at how I would feel at having a part of me removed. It wouldn't be pretty. Over time I have come to realize that hair trauma is a natural by-product when a woman with beautiful, silky, long locks like those that my wife possesses has them altered. Short or long, it doesn’t make a difference. Even when the amount actually removed is barely noticeable to best male-trained eye, the symptoms will appear (begining approximately 3-4 hours after she returns home). That being said I was surprised, but nonetheless well prepared, recently when Mrs. LIAYF suffered a serious bout of hair trauma. The only difference with this particular trauma was that it was not triggered by a shortening of her own beautiful hair. No, not at all. Rather, this particular episode was triggered by a professional barber shortening the moppy locks of none other than our son Lukas! Thankfully, this trauma did pass somewhat sooner than those bouts associated with her own haircuts. Oddly, I could find nothing in the Good Husband Handbook related to this type of trauma transference. Maybe it’s in an appendix? This past weekend Mrs. LIAYF, Lukas, and I had our first experience traveling with another family. We were excited about the weekend getaway, because we were traveling with long-time friends who have a son just a few months older than Lukas. It promised an opportunity to connect at a new level, while enjoying the amenities that a regional state park had to offer. We decided to carpool the 4-5 hour trip (each way) and share a guest house. What we didn't anticipate was the effect that rooming two toddlers not accustomed to sleeping with another person in the room would have on the mood of the trip. As it turned out, the boys ended up keeping each other up most of the two nights, resulting in six tired people. Combine these six exhausted people with certain expectations, perhaps not in sync, about how the trip would unfold, and what you have is a recipe for tension. Add to this nice combo two tired two-year-olds who are having difficulty with the concept of sharing and playing nice on little sleep, and what unfolds is a little pushing, a little grabbing, and one bad bite at the end of a long weekend. This resulted in unhappy and protective parents on both sides. It's only natural, but admittedly took us by surprise. So, the weekend wasn't the complete success that we had hoped for, but we did have some fun times despite the mostly unspoken tension that it brought along (think naked babies on the beach covered with sand!). And, as I mentioned, these are people who we adore and hope to spend many successful outings with as our boys grow older. It was just, as I mentioned, an unanticipated outcome to what promised to be a fun-filled weekend. Perhaps we made a rookie mistake in having such high expectations? How about you readers? Are we alone here, or have you had similar experiences sharing accommodations and transportation with friends while your children were this young? As for us, I think we learned a valuable lesson about expectations and travel with young children. It's certainly a much different experience than we would have expected a few years ago, and we will adjust accordingly. Two events in the past 24 hours have me a smidge concerned. Now, viewed individually these two things would not illicit more than passing notice. However, combine them together - essentially on each others heels - and the perceptive among you will, no doubt, understand where my concern is coming from. First, I received a call from daycare yesterday afternoon indicating that there had been an incident involving Lukas. I should note here that since we returned from our vacation last week our son has been moved from the pre-toddler room up a notch to the toddler room (Otherwise known as The Lair of the Nemesis). When I arrived at his daycare, I was filled in on the events. Lukas and another boy, not named by the daycare, were both coveting the same toy. A tussle ensued, complete with swings being thrown. Both boys recovered, and I had a conversation with Lukas about being nice and sharing with his friends even though I am not sure exactly what took place. It could have been self defense. All was forgotten. Until this morning. While driving to work/daycare this morning I was listening to the radio while Lukas was quietly eating his morning snack and taking in the sights around him. Then a song came on the radio which immediately caught his attention. I glanced behind me to see my son bobbing his head from side to side with a huge smile on his face. Why he liked that particular song, I am not sure. But he obviously really connected with it. What song you ask? None other, than the theme song to 'Rocky'! I'm hoping this isn't a sign that Luke will be taking up The Sweet Science in the toddler room. He has such an adorable little face, all I can think about is what became of Mickey Rourke. Needless to say, i'll be keeping a close eye on these developments. First of all, huge congratulations to Xbox and his wife ET! This is the absolutely wonderful news we have been waiting a long time to hear. 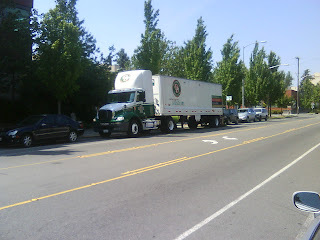 As I headed to get an afternoon jolt of caffeine yesterday, I watched as this big rig pulled up along a busy street and parallel parked into this spot. It was an impressive display, especially given all the people I witness butchering parallel parking with their compact cars in spaces roughly the same size. While walking to the our Neighborhood playground Sunday, Mrs. LIAYF, Lukas and I heard a loud noise. We turned our heads to the right and looked up in the direction of the noise only to see a woman standing buck naked in her upstairs window. Oh, how I longed for such a thing to happen for years before having a wife and son. But this time, we all averted our eyes right away. Along the same street on the way home, we passed by a fenced yard where two aggressive dogs sprinted up barking loudly at us. As we passed with Lukas in the stroller, he turned to the dogs and said "Ruff You!" I couldn't have said it better. I had one of those dumbass moments last Friday. Upon arriving at Luke's daycare to pick him up I ran across the mother of a little girl in his room who was pregnant and obviously due soon. "When is your due date?" I asked. "I actually had a baby boy 3 days ago" was her unfortunate reply. Yeah, that was an awkward moment. For our 10th Anniverary I wrapped all my wife's gifts in Aluminum foil (official symbol along with tin), including Ding Dongs. Because I'm that kind of classy. And finally, for months now, we have been running into a nice couple with a son who is only days older than Lukas. We have been meaning to get together for a playdate, but have only conversed on several occasions. This past Sunday, we found out that the dad, Josh, was actually a musician (he never mentioned it) and was playing at the local farmer's market a couple of blocks from our home. Turns out, he is a very talented singer/songwriter. We were duly impressed. His band is called Westerly. Here is a video (he's the lead). Let me know what you think. A few weeks ago Lukas began to take more interest while his mother or I were 'going about our business'. He would find it fascinating to watch us finish up, flush the toilet and (only because he was watching) announce "Bye bye pee pee" or "Bye bye poo poo". Previous to that we hadn't thought he was anywhere close to being ready for potty training (um, "potty learning"), but this new found awareness convinced us to pull out the toddler potty that a neighbor had passed on to us, as well as a couple of potty books that we picked up in the past few months. We asked him if he wanted to sit on the potty, to which he enthusiastically replied "Yeah!" He sat there and we read him his potty books and, of course, nothing happened. He did remain interested though, and has done regular duty (no pun intended) on his 'seat'. We are by no means pushing Lukas on this at this point, but rather letting him choose to try and use the potty when he feels like it. In the morning and before he goes to bed at night, we will ask him if he needs to use the potty, which he will usually reply "yes." He will push and grunt with "I'm giving it all I've got!" abandon (while Mrs. LIAYF and I attempt to stifle our laughs) and has, on several occasions, succeeded in his efforts. However, we recognize that this is a far cry from him recognizing when he really has to go and letting us know beforehand, which he still doesn't do. 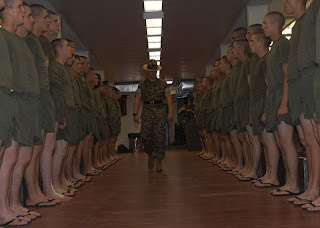 For now, though, it is a great start to basic training and gives us hope that he will be out of his diapers on the early side of the curve. That would be a nice bonus since he is still in cloth diapers, the cost of which can certainly add up. Every little bit counts. Especially when you are trying so hard. Hi all. It's been long enough since I last posted that I had to clear the cobwebs, crack my knuckles a couple of times, and try to remember how to get started. A couple of weeks ago, before departing Terra firma, bound for a tiny speck of land in the middle of the mighty Pacific, I made the decision that I would devote my vacation to enjoying the company of my wife and son, soaking in the tropical sunshine, and clearing my mind of all things work and blog. It was a good decision, as for the past year and a half I have not gone more than a day or two at a stretch without writing, analyzing, or thinking about one post or another. It was, among other things, a vacation from Blogging. Since I did such a fine job clearing my mind, I felt I needed to borrow a concept from someone else. This will be a 'By the Numbers' post. Thanks SciFi Dad. So, without further adieu, here are some of our vacation facts, by the numbers. 0 - Number of pairs of socks worn during vacation. 1 - Number of hours Mrs. LIAYF and I each slept on the 6 hour red-eye home. 2 - Number of Mai-Tai's I consumed on flight from Seattle. 12 - Approximate number of times boys screeched "Elmo!" back and forth at each other while waving the 'action figures' in the air. 250 - Number of miles driven around The Garden Isle while Lukas napped. 2 - Number of parents reluctant that the fun-filled, sunny vacation has ended. As with our previous trips to the Islands, this was a terrific vacation. And, as always, over too soon. Now it's back to work, and also back to blogging.